Infinixmobility is here with something big and special, set to unveil another family of Hot series, known as the Hot S X521. However, it’s known to be the first ever Infinix device feature the Fingerprint sensor (biometric scanner) and VR technology. Virtual reality or virtual realities (VR), according to wikipedia, also known as immersive multimedia or computer-simulated reality, is a computer technology that replicates an environment, real or imagined, and simulates a user’s physical presence and environment to allow for user interaction. 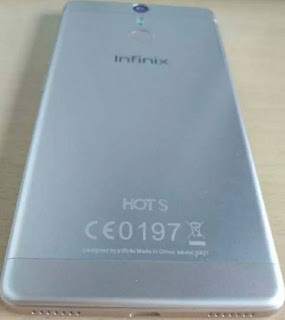 After the leaked images of the Hot S, here are what we have piled about the upcoming Infinix Smartphone. The device will come with 13MP back camera and 8MP front camera with both cameras featuring LED flash. 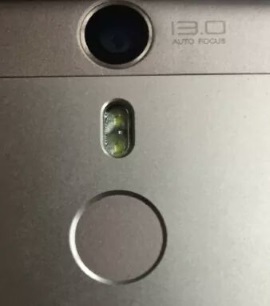 The back camera will feature double LED. The body of the device will be metal all through and it will feature a 5.2″ full HD screen. The Infinix Hot S will come pre-loaded with the latest Android version 6.0 Marshmallow and might be among the first to receive OTA updates of http://littlebitjohnny.blogspot.com /2016/07/google-announced-that-android-70-will.html" target="_blank">Android Nougat 7.0 when its fully unleash. Hot S will come in two versions; 2GB/16GB version and 3GB/32GB version and both will feature 4G LTE! It will be powered by MediaTek Helio P10 octa-core 64bit processor clocking at a speed of either 1.5GHz or 1.8GHz, with Mali-T860 GPU. Those are the specifications that we should expect from the upcoming Infinix X521 device. Launch date and price have not been officially announced, but rumors have that the device will be sold for around $180 (USD) for the 2GB/16GB version and $200 (USD) for the 3GB/32GB version. http://littlebitjohnny.blogspot.com /2016/06/tecno-camon-c9-now-available-for-pre.html">Tecno Camon C9 still buzzing the net and Infinix Hot S is lurking around, many people will be contemplating either waiting for the Hot S or just going for the CamonC9. The final decision will still be dependent on one thing; 'Their price tags'. Stay updated and connected to the Infinix Hot S release date and its actual price. You have finished reading Infinix Hot S X521 - Coming with 3GB RAM, Fingerprint Sensor and VR Technology and many articles about Tech Gallery in our blog this, please read it. and url link of this article is https://littlebitjohnny.blogspot.com/2016/07/infinix-hot-s-x521-coming-with-3gb-ram.html Hopefully discussion articles on provide more knowledge about the world of new tech gadgets.